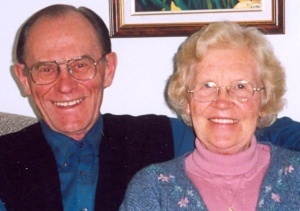 Hugo Werner Jantz: educator and church leader; born 5 March 1930 in Laird, Saskatchewan, to Henry A. Jantz (1902-1994) and Helena (Penner) Jantz (1902-1994). He was third oldest in a family of five sons and two daughters. On 27 June 1954 he married Katherine Goertzen (1 November 1929-18 May 2017) in Virgil, Ontario. Hugo and Katherine had six daughters and one son. Hugo died 12 August 2006 in Winnipeg, Manitoba. Hugo W. Jantz spent his childhood in Laird, was baptized in August 1944 in the Laird Mennonite Brethren Church. He completed his high school at Prairie Bible Institute in Three Hills, Alberta. He preached his first sermon at the Laird church in August 1947. Following a year at the Eden Bible and High School in Niagara-on-the-Lake, Ontario, Hugo studied at Mennonite Brethren Bible College (MBBC) in Winnipeg, Manitoba. Following graduation from MBBC in 1953, Hugo accepted a teaching position at East Chilliwack Mennonite Brethren Bible School. In January 1956 he was ordained for ministry in the Broadway Mennonite Brethren (MB) Church by Jacob Bergen and A. H. Unruh. Hugo and Katherine then embarked on a long career of mission, teaching, and congregational ministry, with Katherine also working years as a nurse. In 1956, under the Mennonite Brethren Board of Foreign Missions, they accepted a call to serve in Quito, Ecuador, where Hugo was assigned to the German-language department with the missionary radio station HCJB. After four years in Quito, they returned to North America and he completed an undergraduate degree at Tabor College, in Hillsboro, Kansas, before moving to Neuwied, Germany in 1961 to do five years of pastoral work among Mennonite and other refugees from eastern Europe and Russia. Then followed eight years in which Hugo taught Bible and pastoral theology at Mennonite Brethren Bible Institute / Columbia Bible Institute in Clearbrook, British Columbia. During that time, he also served as assistant pastor in the Yarrow and Clearbrook MB churches and pursued graduate studies at Western Washington State University in Bellingham. In 1974 the family, now with seven children, moved to Winnipeg, Manitoba, where Hugo became pastor of the Fort Garry Mennonite Brethren Church. During this pastoral stint, Hugo raised the eyebrows of colleagues and friends when he refused an increase in his salary, seeking solidarity with parishioners who were suffering from an economic downturn. He also conveyed a concern for service and missions that motivated a number of his members to these ministries as life choices. After concluding his ministry at Fort Garry, Hugo served as church relations director, first with MBBC (1977-1980), then with the Canadian office of Mennonite Brethren Missions/Services (1980-1985). During these years in Winnipeg, he also served for ten years on the board (beginning in 1974) of Mennonite Central Committee (MCC) Canada and executive committee of MCC International. He was chair of the MCC (Canada) board from 1978-1983 and for several years vice-chair of MCC International. Hugo Jantz was known and admired for his strong personal and family relationships, his unpretentious manner and sense of humor, as well as his engaging preaching. He was a great admirer of German theologian Dietrich Bonhoeffer and quoted him often. He also valued and promoted relationships among Mennonites, both through MCC and through his service and membership in both the Mennonite Brethren and (in his final years) Mennonite Church denominations. Burkholder-Rempel, Byron. "Jantz, Hugo W. (1930-2006)." Global Anabaptist Mennonite Encyclopedia Online. January 2010. Web. 24 Apr 2019. http://gameo.org/index.php?title=Jantz,_Hugo_W._(1930-2006)&oldid=148310. Burkholder-Rempel, Byron. (January 2010). Jantz, Hugo W. (1930-2006). Global Anabaptist Mennonite Encyclopedia Online. Retrieved 24 April 2019, from http://gameo.org/index.php?title=Jantz,_Hugo_W._(1930-2006)&oldid=148310. This page was last modified on 24 May 2017, at 01:51.